Louis Maistros discusses the power of magical realism, characters nagging at his subconscious, and the phenomenon of conscience. Interviewer Luan Gaines: What was your inspiration for The Sound of Building Coffins ? What is the meaning of the title? Louis Maistros: Specific instances of inspiration are difficult for me to pin down. The creation of this novel began with a short story I wrote in 2000 called “Can’t No Grave Keep My Body Down” - which ultimately became the final chapter of The Sound of Building Coffins . Marcus Nobody Special, the main character of that short story, would not let me be done with him – he kept nagging at my subconscious to continue, and my daydreams became infested with new characters from Marcus’ fictitious world who became very insistent that I write their stories down as well. Eventually they poured themselves out on the page through me – my own role in the creating of this novel seeming more as that of a medium at a séance than a writer of a book. One reviewer, Patrick Millikin, stated that the novel felt “dictated from a fever dream of automatic writing.” That is actually very close to the truth. Although the story is historical fiction and steeped in elements of magic realism, much of the emotional content is autobiographical and reflects the various ups and downs that I personally experienced during the seven-year period in which I wrote it. The story was meant as a thank you note, a love letter, and, ultimately, a get well card to the city that I love and have called home for the past fifteen years. New Orleans gave me a second chance in life, allowed me to break away from the drudgery of a previous life and reinvent myself as an artist in more absolute terms. Long before the coming of the 2005 storm, New Orleans, to me, was always about rebirth and redemption. It is my hope that this novel will put that gratitude across – if in an unfiltered and sometimes painfully honest way. In 2002, there were two major hurricanes approaching the City of New Orleans, one right after the other, less than a week apart. The names of those storms were Isidore and Lili. It was a very stressful two weeks for everyone in the city as it seemed the hyperactive storm season had us constantly under the gun. On the night before Lili made landfall, my wife and I stood out in front of our home, feeling the wind whipping cool and strong, and quietly listened to the constant noise of hammering as our neighbors busily worked to reinforce their windows and doors. It is a very eerie sound, one that we have become far too accustomed to, and in the resigned gloominess of that moment I remember saying to my wife, “It sounds as if the whole city is building coffins.” That analogy stuck in my mind and a slight variation of it eventually became the title of the novel. The novel begins with nine-year-old Typhus Morningstar “rebirthing” fetuses in the river. An exorcism is soon to follow. Would you explain why an appreciation of this novel might require some suspension of ordinary belief? Although much of what can be seen and felt in the novel is a realistic depiction of New Orleans at the turn of the century, there is also a heavy element of magic realism present throughout. The reader will get a good sense of what to expect in that regard from the very first chapter, as you mention. Once you get a feel for what the rules of reality vs. super-reality are in the world of the novel, even the more far-out imagery attains a sort of logical order to it. I think what may require “suspension of ordinary belief” is the fact that this is not a straight-up fantasy story; the contrast of impossible imagery against a backdrop of stark reality can be quite jarring, which is the intention. A critical element in the story is the demonic possession of Dominick Corolla, a one-year-old baby. What is the relationship of this child’s possession to the violent death of his father, Antonio? The unjust death of Dominick’s father, Antonio, is what activates the decades old Vodou curse that lay dormant for so long, its initial manifestation being the possession of young Dominick. Why it comes about in this way is difficult to explain without giving too much away for those who haven’t yet read the novel – but I will say that the domino effect begins with the messenger and not the message, and that the messenger isn’t necessarily who you think it is. The person in question is someone very close to Malvina (the creator of the curse), and this person is not even aware of this relationship till much later in the story. Baptist minister Noonday Morningstar often hears the voice of God. Although clearly instructed to leave the humble home of the Sicilian widow and her baby, he returns to do battle. Why doesn’t Noonday heed God’s very specific warning? This is a central theme of the novel, and one that I’ve been exploring in my own heart for years. I have often wondered about those who claim to have heard the voice of God – and I want to make clear that although I wonder, I never judge. I do think that all humans communicate with God, or our higher power (or whatever you choose to call the object of human faith), in our own unique ways. Most are only aware of the “outgoing” messages, or prayers. But there is also, I think, a very obvious and constant incoming message from our higher power, and that is the phenomenon of “conscience” - that is the in-born knowledge of the difference between right and wrong. In my mind, this gift of conscience is the closest thing that we have to a manifestation of direct contact and communication on a daily basis with a higher power. Which brings up an interesting question: If a person hears, in the more literal sense, the voice of God, and that voice instructs a person to go against that person’s gift of conscience – how does one proceed? Do you follow the voice that you hear with your ears, or the truth that you feel in your heart? Could it be that the voice in your heart disproves the authenticity of the one you hear with your ears – or vice versa? Or are these things related somehow? Time and again in this world we hear stories of disingenuous preachers instructing people to act against their own consciences, claiming authority on the basis of their own alleged direct communications with God. Sometimes these are outright malicious persons such as Charles Manson or Jim Jones, and sometimes they come in the form of greedy television preachers. But if you place your faith in these people (be they right or wrong), are you committing a sin of the heart if you go against their specific instructions to follow your own “gift of conscience”? Although faith can be a beautiful thing, it can also be misguided and corrupted by the greedy and manipulative among us. It is an ancient problem, and one that is very hard for people to come to terms with. No one likes to admit they’ve been duped, especially in matters of faith. Which leads us to Noonday’s dilemma. He determines that the more literal voice he hears is false and instead chooses to follow the one in his heart, knowing that to do right is the true will of God. It is a decision faced by others in the story as well. In fact, Typhus suffers a simultaneous and similar dilemma as he must decide whether to follow his father’s specific instruction or do what he knows his father actually needs of him. “It is the demon himself who must be saved tonight.” Please explain this statement. Another continuing theme of the novel is the idea that nothing in the world is either purely evil or purely good. Noonday determines that the demon may not be entirely what it seems, and that to enlighten rather than destroy an entity perceived as evil might be the only true path to redemption for any of us. A good friend of mine, the great American novelist Donald Harington, once told me that there are no evil people in the world, just badly mistaken ones. This makes a lot of sense to me – although it can be a bitter pill to swallow in extreme cases. The idea is that most people who we regard as evil actually believe they are doing the right thing – but are simply badly mistaken about that. Is it possible to be truly evil if you believe in your heart that you are doing what’s right? It is an ages-old theological debate, but Noonday’s belief that he can “save the demon” is the gamble he chooses to take when he places his faith in the basic decency of humanity. You first introduce Buddy Bolden, the great jazz musician, as a fourteen-year-old boy, his unique sound still evolving. How much of Buddy’s difficult life is determined by his character, how much by his genius and how much by circumstance? What is his fate? My deeply fictionalized portrayal of Buddy Bolden uses some of what is known about the real Buddy Bolden, but there are so many holes in his written history that I took many liberties in my depiction. In my story, he is not so much a genius as he is an accidental vessel of the jazz message; jazz being a spiritual entity itself in the context of the novel. The delivery of jazz to the world is a burden to him in some ways; though it brings him a degree of success and fame, it is also a heavy responsibility. This conflict might be seen as a metaphor for any work of art that has success flung upon it unexpectedly – be it a hit song or a bestselling novel or other. Does the beauty and inner truth of the art itself shine through and give enlightenment and joy to its audience – or is the sole intent of the artist to strictly profit from the seductive aspect of the object created? Buddy doesn’t realize that his gift can be either a blessing or a curse, a thing that can create either spiritual realization or malicious effect. It can also manifest both ends of the spectrum at once. His ultimate destiny is to learn that there are sacrifices involved with possessing such a gift, and in passing it on. With good comes bad, and vice versa, always. Dr. Jack is an abortionist and a witchdoctor that reporter Marshall Trumbo engages to attend the exorcism of the child. What is Trumbo’s motive for selecting Dr. Jack in lieu of another doctor? Marshall Trumbo has a crisis of faith when he witnesses the brutal possession of young Dominick, and sees firsthand how attempted interventions by both doctors and priests are ineffective. As with Noonday Morningstar, he goes against all that he’s been taught regarding the existence of God to do what he believes to be morally correct under the circumstances. Although he’s been taught that it’s a sin to enlist the help of a “witch doctor,” he does so anyway because he wants desperately to relieve the suffering of an innocent. Again, the message is: if you believe in a loving God, you can never do wrong as long as you act unselfishly, never do harm, and always do right to the best of your understanding. The widower Reverend Morningstar names his children - Typhus, Diphtheria, Cholera, Malaria and Dropsy - after diseases. What is his reason for naming his children and how do their names reflect Morningstar’s philosophy? “Morningstar saw life as a trial and death as a reward, a bridge to paradise—and he saw God’s mysterious afflictions of the body as holy paths to that salvation. Disease may be a source of pain and hardship on earth, but what can be kinder and more blessed than a shortcut to heaven through no fault of your own? What could be a more magnificent display of God’s powers than the merciful, invisible insects that float through the air to infect the body, guiding you to your last breath and on to reward? Typhus Morningstar possesses the gift of sight, his perspective unlimited by the parameters of real life. Does this gift enhance the boy’s life or burden it? How does Typhus view his path? It is interesting that you use the word “sight,” while in the book the word used is “understanding.” Really, for the purposes of Typhus’ part in the story, these words are fairly interchangeable. Although each of the characters of the novel spring from components of my own subconscious, Typhus is the one that I identify with most closely. He is born into tragic circumstances, but manages to maintain an unusual wisdom at a young age; wisdom based on common sense observations of his own troubled life and the lives of those around him. As a child, Typhus exhibits amazing inner strength and courage – as many children in real life are sometimes forced to do. But when Typhus is confronted with a gravely traumatic experience, one that he is unable to process in the usual way, he finds himself unable to cling to his any facet of his former innocence except by maintaining the physical characteristics of a child. And so his growth is stunted permanently and he lives the rest of his life trying to balance the common sense rules of his childhood with the harder realities of adulthood. Typhus ultimately loses his way; finding reason to wander from the path of hope and truth and, instead, spiraling downward on a trajectory of bitterness and despair. Ultimately, he’ll need the assistance of those who dwell in the Spiritworld before he can find his way again. Typhus believes he will never enjoy a romantic relationship with a woman because of his small stature. How does a stranger’s photograph assuage his need for a conventional relationship? Is there a penalty for his naiveté? Typhus’ longing for true love is a problem he cannot seem to find an answer to on his own. The problems of others always seem easily solvable to him, but where matters of his own heart are concerned he is confused and almost unreasonably open-minded to the suggestions of others. Unfortunately, he places his faith in Dr. Jack, his friend and mentor, who introduces him to the photograph of Lily. Typhus is so relieved to have something like a romantic relationship, even an imaginary one with an anonymous woman in a photograph, that he allows himself comfort in the acceptance of it. Of course, such an imaginary relationship can’t possibly end well. Part of the unfolding drama in the novel is initiated by Malvina Latour, a voodoo mambo; in fact, various characters are touched by fate long before the confrontation with evil the night of the exorcism. What do such connections reveal about the consequences of impulsive or vengeful actions? As before, a character in this story does a thing that may be viewed as evil – but this “evil” act is committed for all the right reasons. Malvina has acted on her love, and believes she is in the right. But she has also been careless and vengeful, has taken things too far. The repercussions of her actions will be far-reaching and difficult to reverse. Malvina is an essentially decent person, but she allows her anger to rule her actions – as we all do from time to time. Malvina’s regrettable deeds spur a domino effect of suffering of many, but there is a lesson to be learned from the suffering. As the characters struggle to find their way through the fog of their lives, most of them will ultimately gain reward by way of a new understanding – if not in this world, then in the next. Marcus Nobody Special tells Malaria Morningstar, “That Jim Jam Jump ain’t quite human, darlin’, he done latched onto your brother Dropsy.” Who is Jim Jam Jump and why does Dropsy idolize him? Jim Jam Jump, to me, is a metaphor for the troubled children of New Orleans. In New Orleans we have children who tragically embark on lives of crime at a very young age, some even committing murders; dismissed out-of-hand as irredeemable, with fear and contempt, by many in the community. And yet they are still children. They are not bad, these kids, but they were born into bad circumstances – perhaps even hopeless circumstances (if you believe there is such a thing as “hopelessness,” which I do not) – and they respond to their circumstances in a way that seems logical to a child; in a mode of survival. There comes a time in the life of each child when he is able to make a more informed decision about how to continue his own life-path into adulthood -- but for these troubled children it takes enormous strength of character to break away from the bad hands they’ve been dealt from the beginning. Some make that breakthrough, and some are lost – as is Jim. The tragedy here is that any child is ever asked to rise above a situation of such difficulty in the first place. Jim Jam Jump, in the story, is seen by most as pure evil, but he is not. At a very young age his soul was taken by force, by a demon - but he was also blessed with a loving hand holding his heart. As he goes on he has ample opportunity to choose either a direction of righteousness or of malice. Unfortunately, for all his strengths, Jim is weak in a way that allows him to believe that his unfortunate past defines him, and so he embraces his darker side. Dropsy idolizes Jim for the same reason that many good children idolize the “bad boy” type. It is the allure of what is forbidden, the seduction of danger. They are envious of the apparent power held by those who dare to defy the rules of basic good conduct. These “good children” always assume they can back away from danger whenever they choose, but often find this is not always the case. Why does Jim Jam Jump covet Buddy Bolden’s horn? Jim feels drawn to Buddy’s cornet because it was the instrument that knocked the demon from his body when he was a baby -- there is a strong subconscious tie there even though he may or may not remember the events of that night in the present. Jim does recognize the power of the music that comes out of the cornet, known as jazz, and understands that the seductive aspects of this new art form can be used to corrupt the hearts of men just as it can be used to enlighten the mind and broaden the spirit. Really, Jim understands the potential of jazz much more clearly than Buddy – who mainly sees it as a way to make a decent living, get free drinks, and win the attention of loose women. Death stalks the pages of The Sound of Building Coffins , a world where the spirits of the dead intrude on the living. How would you describe the intimate relationship between life and death in New Orleans? Is this relationship accessible only to those who intimately experience the opportunities and misfortunes of daily life? The unusual relationship that New Orleans has with death, as I see it, is described in depth in Chapter Fifty-Six of the novel. But in more direct terms: I see New Orleans as a town that it is constantly confronted with its own mortality, more so than most other American cities. We live below sea level, surrounded by water; our protective coastline deteriorating while hurricanes get more destructive each year. Our education system and our economic infrastructure breed an endless cycle of poverty, drug trafficking and violence. In New Orleans the presence of death is more obvious than in other places, but our response is not to run and hide from it – instead, we embrace and integrate it into our daily lives. We understand that the cycle of death is complimented by an endless cycle of rebirth. Parades and funerals are interchangeable events. Death’s constant reminders only encourage us to live life to its fullest. The constant presence of death makes our lives more vigorous, more joyful. For those willing to make the sacrifice, it is an even trade. Over the years, all of Morningstar’s children are touched by tragedy, only one blessed with a more hopeful future. Are the fates of these characters specific to your novel or a reflection of life’s patterns in such a place and time? I don’t know a single person in this city who has not been touched deeply by some kind of personal tragedy. Tragedy seems to be part of the common fabric we all share here. With the novel, it was important to me to keep things real in that regard. In real life, people die for stupid reasons. Even children die for stupid reasons. In real life, good people are confronted with horrendous circumstances and do the best they can to find their way through them, sometimes making mistakes along the way, sometimes doing irreparable harm. But through all the trouble and heartache; if a life is lived with urgency, respect and joy; then it is a life worth having lived. As the hurricane of 1906 approaches, the world of the spirit becomes animated, lost souls reunited with their loved ones. How does this merging of the real and the unreal just before the hurricane foretell the imminence of death, a balancing of accounts? It might appear that evil forces have put the storm on its destructive path, but the true cause of the storm is to cleanse the city’s body and soul, and to deliver the message of jazz (be it good or bad) to the rest of the world through the waters of the Spiritworld. In a sense, the negative forces of the novel will ultimately do good by bringing destruction to the city – because only through that destruction is the continuation of life possible. From the perspective of the dead who inhabit the Spiritworld (or afterlife), it is the living who are as ghosts. As the storm approaches, those in the Spiritworld reach out to the living, not to warn them but to make amends and clarify past spiritual and emotional confusions so that their transition to reward, or life in the Spiritworld, may be better accommodated. The Sound of Building Coffins seems born of time and experience, part of its charm an utter unpredictability, the characters unrestricted by the conventions of the known world. Are you writing another novel? If so, can you share something about it with us? The novel I am currently working on is entitled “Holy Meaux.” This is another New Orleans historical novel, but this time set in the gritty underground R&B culture that was active in the early 1960s. The story involves a piano-pounding, bible-thumping, junkie-pimp who gets wind of the plot to kill JFK through his criminal underworld connections. Of course, he is a person who lacks credibility with the authorities, so he cannot get anyone to believe there is such a plot in the works. He endeavors to stop the assassination on his own, with results that range from amusing to tragic. That’s all I can say about it at this point. Writing and publishing are two almost absurdly incompatible concepts, and yet hand in hand they go. The disclaimer to anything I might say about reconciling these things is this: There are an infinite number of ways to get published, and what worked for me might not necessarily work for you. So take all advice with a grain of salt. That being said, my primary advice would be: Always stay true to your vision as an artist. If you concern yourself too much with a novel’s potential salability while still in the act of writing it, you are more likely to end up with a result that you are not pleased with from an aesthetic standpoint. When creating, place your trust in your subconscious – and make sure the work rings true in your heart before you deem it complete. Don’t worry about selling it till after it’s written – if the work has merit, a good agent and/or editor will recognize that and help you to mold it into something that is more easily digestible for the masses, if need be. My other piece of advice would be this: Don’t obsess on your daily word count. I know that many professional writers suggest meeting a daily word quota, and I suppose this can be very helpful to some. However, I have found that obsessing on the number of words you have written can interfere with your ability to focus on choosing the right words in the first place, which is infinitely more important. Sometimes staring out the window and daydreaming is more productive than sitting and typing and increasing your word count. If counting words is helpful to you, go ahead – but if not, please admit it to yourself and focus on the quality of the words that you choose to put on the paper, as opposed to their current quantity. Another important thing: Never place your personal dreams above the welfare of those who depend on you. Your life as an artist will never be more important than the time you spend with your children. I should warn the reader that many, many writers would disagree strongly with the advice I just gave. But as I said, I can only tell you what has worked for me personally. The last bit of wisdom I’d like to share is, I hope, not terribly debatable. That is: Write for the love of writing, and never let yourself be discouraged by the comments of others to the point where you are willing to give up. If you are in it for money and fame, you’ll most likely be disappointed. Always stay true – and always keep moving forward in the development of your voice. No matter what discouraging events may cross your path along the way (and there will be many) if you end up with work that you are proud to have created, the work itself will be its own reward – and your chances of finding a publisher will be increased at the same time. Louis Maistros is a longtime resident of the New Orleans 8th Ward neighborhood. Along with his wife, Elly, he owns and operates Louie's Juke Joint, a combination jazz record shop and Vodou botanica. Maistros is a former forklift operator and a self-taught writer. His work has appeared in the New Orleans Times-Picayune and the Baltimore City Paper. He is mildly self-conscious about the fact that he shares a birthday with Lee Harvey Oswald, and is currently working out a conspiracy theory about that.. 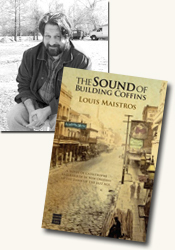 Journalist Luan Gaines interviewed author Louis Maistros, author of The Sound of Building Coffins (see accompanying review), about his book for curledup.com. Luan Gaines/2009.